I'm fiendishly organized. But I'm also like one of those museum curators that has too much content for their exhibit space so a lot of the really kewl stuff is sitting in locked storage rooms, behind the scenes and you have to wait until it comes into rotation in order to catch a glimpse of it. And I curate a lot of content. So much, in fact, that I can forget for weeks to go through the articles and videos that I have bookmarked for later. Which is how I lost track of this. The opening sequence is a bit long but take it all in. He's showing you a number of tricks from the basic to the complex. 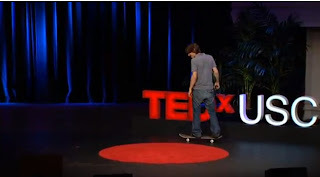 He's completely charming and seemingly laid back and yet some of his descriptions of the mechanics behind skateboarding are fantastic. My favourite being: "...all of these tricks are made of sub-movements, executive motor functions, more granular to the degree to which I can't quite tell you, but one thing I do know is, every trick is made of combining two or three or four or five movements." the borderline (and sometimes not so borderline) illegality of their activities. Great messages wrapped in an unexpected context. Pretty much the recipe for a stellar TED Talk. I apologize for having held onto it so long before sharing it with you. Enjoy!